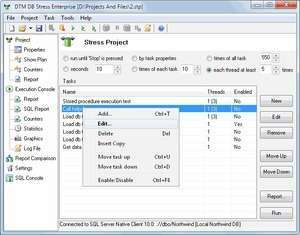 DTM DB Stress is a utility for stress testing the server parts of information systems and database applications, as well as DBMSs and servers themselves. This tool allows you to create and configure a continuous set of requests to the server of the OLAP (query execution) and OLTP (adding, modifying and deleting data) types. The program is useful for any information system developer or any QA department employee. For security reasons, you should also check out the DTM DB Stress download at LO4D.com which includes virus and malware tests. Additional screenshots of this application download may be available, too.